Wow. Just went and saw "Battlefield Los Angeles." If you like action filled movies; then you've gotta see it! The entire time I was like half sitting on my chair, and biting my nails from the suspense. Honestly I went to see the movie, just because Aaron wanted to. 15 minutes in and I was hooked. The movie is packed full of aliens, so if your not an alien fan then it's not a movie for you. But again, if you love action packed movies, then it's a must. I can't stop raving at how awesome it was. Trust me; I so want to go into detail, but I don't want to ruin it for everyone. I can pretty much guarantee, that if you see this movie; your gonna love it! Have any of you seen the movie? If so, I'd love to know your favorite part :)! Because of my government that gave taxes in Hollywood movies and Hollywood has stopped sending their movies to Indonesia, we can't see Hollywood movie anymore. I really want to see this movie. I haven't seen this yet, but would like to. Thank you for the review!! One word, PREDICTABLE! I want my money back because I've already seen this movie on July 4, 1996. 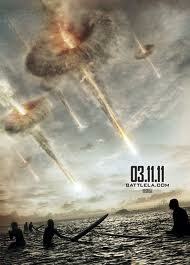 This movie is pretty much a remake of Independence Day. The script is poorly written and the military moments are laughable if you have any military experience. Save your money, I'll be requesting mine back!